To fractures of the upper third of the humerus include: fracture anatomical neck shoulder (very rare), fracture surgery neck shoulder separation of a large hill and combined fractures (surgical neck shoulder and a separation of a large hill, dislocation of the shoulder, with a margin of a large hill and others). Fracture surgery neck shoulder is the result of a direct blow at the bottom of the shoulder, falling on his arm or hand outstretched arm. Fracture surgery neck shoulder may be impacted when peripheral fragments wedged in the Central, of abduction - outlet when peripheral fragments displaced outwards, and adduction - leading, when peripheral fragments biased towards the armpit. Impacted and adduction fractures in the armpit is introduced roller bobowicko form fixed by the neck and torso gauze bandage (Fig. 14, A). 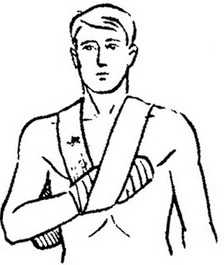 The forearm is placed at an angle 35-45 degrees and in the elbow joint on the serpentine bandage E. F. Drawing (wide gauze bandage, quilted with cotton wool), wrapped in double-tour around the lower third of the forearm, wrist and hand (Fig. 15). When abduction fractures in the armpit is entered three-cornered, encased with cotton wool and gauze bus (Fig. 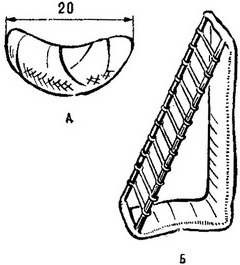 14, B), and the shoulder rests with gently sloping side, the vertical direction is to the body, and the forearm is also serpentine bandage E. F. Drawing. Such laying relaxes the muscles in the affected arm, helps to reposition of fragments and reduces pain syndrome. Therapeutic physical training is assigned to the 2nd day of the injury and conducted by the method that provides for a gradual reduction, consolidation of fragments and restore lost functions. In the first period of training objectives are: maximum relaxation of muscles of the shoulder girdle and the affected arm to the correct mapping of fragments; pain; resorption hemorrhage; restoration of blood and lymph circulation and metabolism in the injured extremity. To solve these tasks it is recommended the following exercises in the original standing, leg, same with the injured hand, put forward a step forward, the torso forward and to the side of the patient hands (using healthy hand to take out from kerchiefs sore arm): 1) pendulum-like rocking relaxed her arm back and forward; 2) a circular motion clockwise and counterclockwise; 3) "throwing" hands behind your torso forward and back; 4) the stretching and bending of the fingers into a fist (thumb inside and outside) - this exercise promotes the resorption of extensive hemorrhage, which usually happens when these fractures on his shoulder and forearm; 5) bending and straightening of the elbow, with his hand in a headscarf at right angles,is to move your hand from right to left and Vice versa - to take and lead in front of chest; 6) put your hand in the original position, straighten up, to raise our shoulders and lowered; to reduce the blades and breed. Each exercise is 6-10 times, and the whole complex is repeated 8-10 times a day. The duration of the first period of 10-14 days. In the II period, the task of medical physical culture is to restore the function of damaged hands in the shoulder joint ability to perform movements in all directions. In the II period are friendly exercise healthy and sick hands on two assumptions. In the first original position - the torso forward the following exercises: 1) moving forward and backward; 2) circular motion in both directions; (3) a movement from right to left and Vice versa; 4) "throwing" hands over the torso forward and back; 5) krestnye flight movements in front of the chest; 6) hand in the "castle": bent at the elbow joints of the hands, bring it to her mouth and down, bring it to the forehead and lower, raise your head and lowered. In the second original position - the main position is the following exercises: 1) exercises with objects (stick, rubber and volley balls); 2) exercise with the movement of his hands on the wall up and down; 3) exercise on the block with movements in all directions. In the II period, each exercise is repeated 10-15 times, and the whole complex is 4-6 times a day. III period - training - aimed at the final restore the function of damaged hands and the whole organism. In this period are applied stops, vises, exercises with dumbbells, printed ball (3-5 kg), therapeutic swimming, playing volleyball, basketball and other Restoration of function and disability occurs approximately in 1.5-2 months from the moment of fracture. In the treatment of impacted and abduction of fractures solitaire removed in 3 weeks, and three-cornered bus in the treatment adduction fractures - 4-5 weeks. In case of surgical intervention (with strong displacement of bone fragments and with comminuted fractures of the damaged finiteness fit onto the bus for 3-4 weeks. In the first period of the method of therapeutic physical culture similar to the technique used in the treatment of diaphyseal fractures of the shoulder onto the tires, II and III of periods carried out according to the method of conservative treatment of fractures surgical neck shoulder. In any epiphyseal damage of the humerus in the third period recommended training in therapeutic swimming pool. Fractures of the upper end of the humerus to the sports training proceed as instructed by the doctor, but not earlier than 3 months after injury.